Among our area’s most colorful and continuous vintage harvest experiences were the September threshing bees first organized by Chris Busch at his farm near Colton, Washington, in 1947. 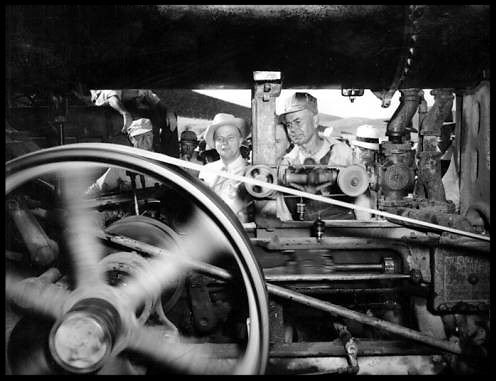 Busch had known steam-powered threshing from his Palouse Country youth and as the massive old machines and harvest wagons became obsolete he began a collection that numbered over thirty in various stages of operation in the 1940s. Word spread throughout the region about the remarkable assemblage and with help from a dedicated network of other enthusiasts including neighbor Bill Druffel and C. R. Miller, retired WSC professor of agricultural engineering. Busch organized the Western Steam Fiends Club in 1951 with members eventually drawn from six states and three Canadian provinces. The event kicked off with a grand banquet sponsored by local church and school volunteers followed by a parade led by Busch’s favorite 1912 Minneapolis engine, 1917 McCormick reaper-binder, and Case separator. A spectacle of old-time harvest festivities followed that drew as many 4,500 onlookers, and the tradition is carried on today at the annual Palouse Empire Threshing Bee held on Labor Day weekend at the county fairgrounds near Colfax, WA.